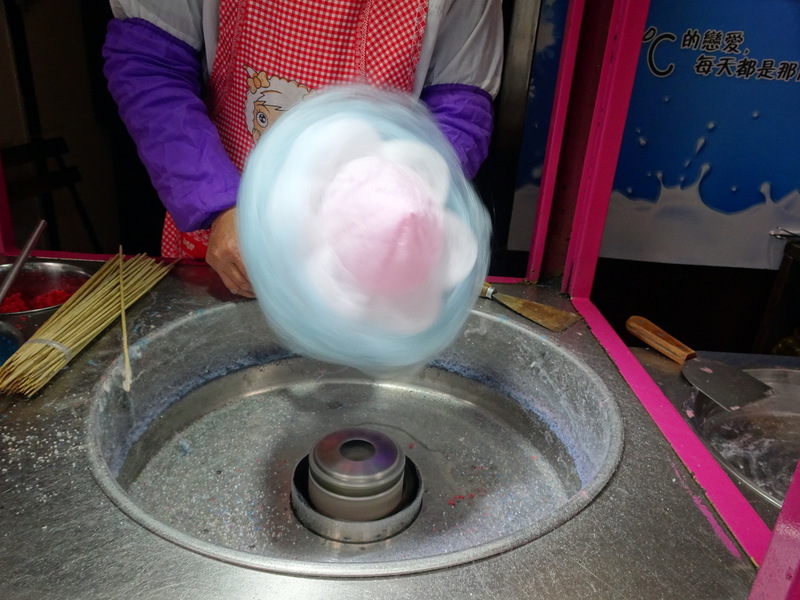 While there are earlier claims to various forms of spun sugar, Wikipedia reports that machine–spun cotton candy (then known as fairy floss) was invented in 1897 by confectioner John C. Wharton and dentist William Morrison. If you sense a possible conspiracy here, you may be right. 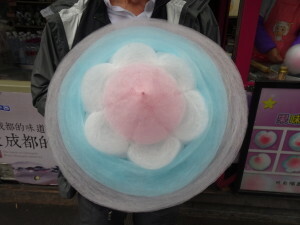 Cotton candy was first widely introduced at the 1904 St. Louis World Fair (aka the Louisiana Purchase Exposition). 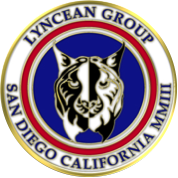 As in modern cotton candy machines, the early machines were comprised of a centrifugal melter spinning in the center of a large catching bowl. 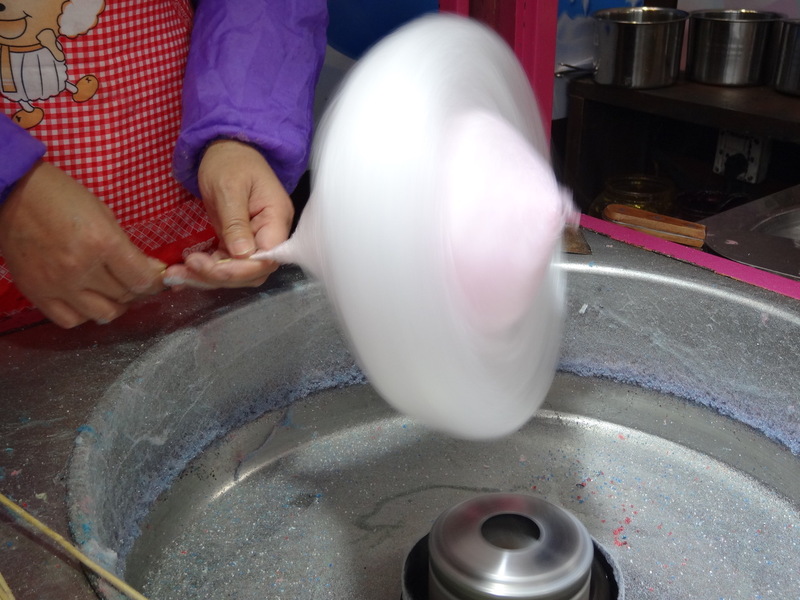 The centrifugal melter produced the strands of cotton candy, which collected on the inside surface of the surrounding catching bowl. The machine operator then twirled a stick or paper cone around the catching bowl to create the cotton candy confection. 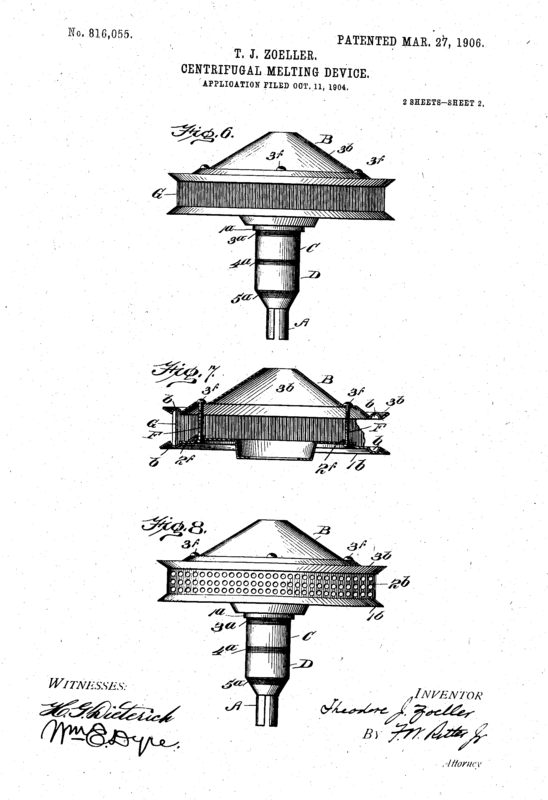 Two early patents provide details on how a cotton candy machine works. His novel feature involved moving the heater to the rim of the centrifugal melting device. 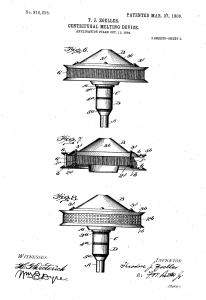 “This invention relates to certain improvements in candy-spinning machines comprising, essentially, a rotary sugar-receptacle having a perforated peripheral band constituting an electric heater against which the sugar is centrifugally forced and through which the sugar emerges in the form of a line (of) delicate candy-wool to be used as a confection. 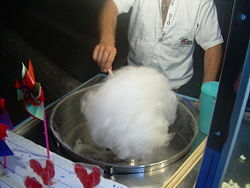 This is the same basic process used more than a century later to make cotton candy at carnivals and state fairs today. The main problem I have with cotton candy sold at these venues is that it often is pre-made and sold in plastic bags and looks about as appetizing as a small portion of fiberglass insulation. 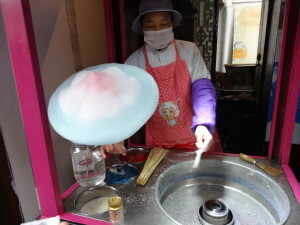 Even when you can get it made on the spot, the product usually is just a big wad of cotton candy on a stick, as in the photo above, which can be created in about 30 seconds. 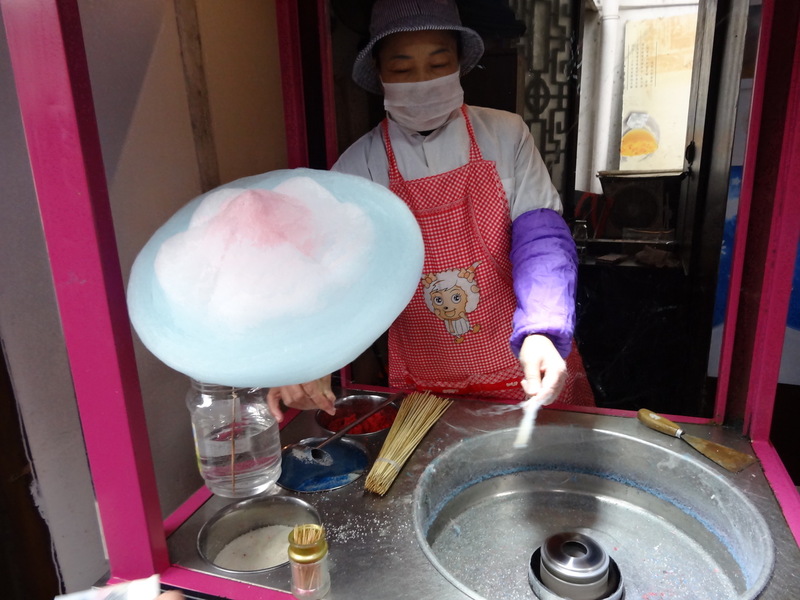 Let me introduce you to the best cotton candy in the world, which is made by a real artist at the Jinli market in Chengdu, China using the same basic cotton candy machine described above. 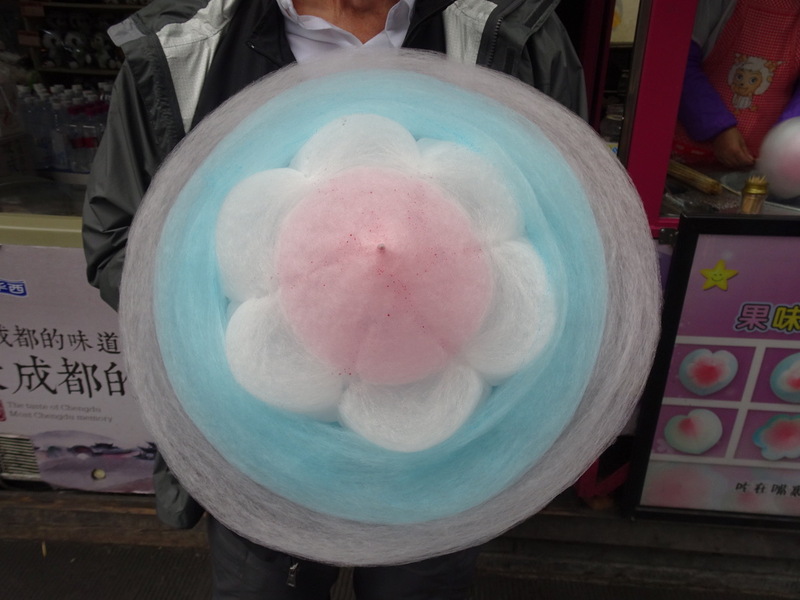 As far as I can tell, the secret is working with small batches of pre-colored sugar and taking time to slowly build up the successive layers of what would become the very delicate, precisely shaped cotton candy flower shown below. This beautiful confection was well worth the wait, and, yes, it even tasted better than any cotton candy I’ve had previously.